What is SMA 1, 2, 3, and 4. And Type 0! 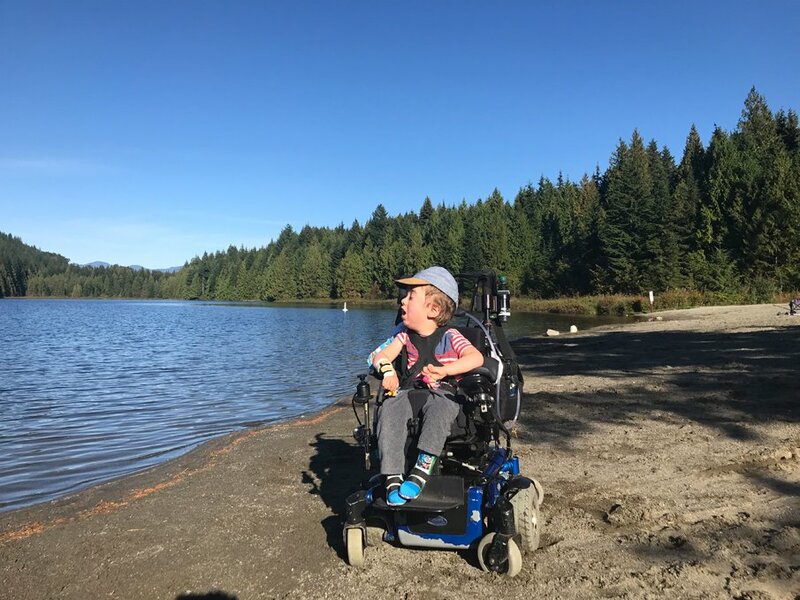 In the last blog post we made a huge proclamation, that Emmett has progressed to presenting as a toddler with Spinal Muscular Atrophy Type 2 versus Type 1. However, I did not go into details nor did I provide any definitions. My friend, Sharon, commented that I made her do some research to figure out what was the difference, so here is a recap. *Please note that the descriptions of Emmett that follow are going back in time. Spinal Muscular Atrophy describes the group of diseases in which a progressive degeneration of the spinal nerves causes a wasting of the muscles they control. 1 in 50 people are carriers of the survival motor neuron 1 gene, which decreases survival motor neuron protein, and this decrease causes the destruction of the nerves in the spinal cord that control neuromuscular growth and function. Carriers experience no symptons. Carriers do not develop the disease. When two carriers have a child, there is a 1 in 4 chance their child will have SMA. It can vary in severity. SMA type 1 - most severe and the life expectancy is incredibly short. There are some amazing exceptions. Infants identified immediately upon birth may be referred to as SMA type 0. SMA type 2 - children have greater SMN protein but still have a shortened lifespan and can never stand independently. SMA type 3 - children have a normal lifespan but have life-long physical disabilities. SMA type 4 - adult onset. Prior to the drug Sprinraza there was No Treatment. 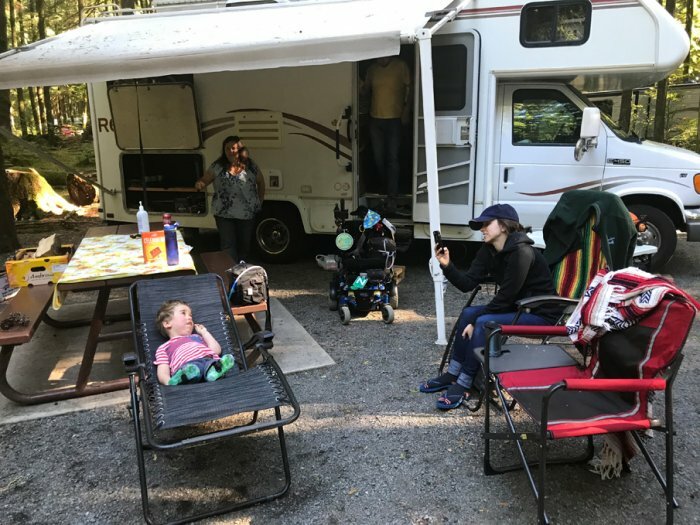 Parents were told to love their little ones, provide them with as many experiences of life as they could, but realize that respite care was the only available care. Emmett was born in 2015 and he was involved in a worldwide trial of the drug that involved 124 little ones around the world. 2/3 of the little ones got the drug/1/3 of them got the placebo. The kids and families on the placebo were promised the drug after the test if the drug proved successful. The drug was amazing - the kids receiving the drug were improving. The kids on the placebo were literally dying. The company ended the test early, pushed for early approval of the drug from the USA FDA, Health Canada, etc. At about three months of age Emmett lost the ability to move his legs. He never developed the ability to hold up his own head. His grip was weak and his wrists curled. He was a stomach breather. He was an incredibly floppy baby. And he was incredibly cute! 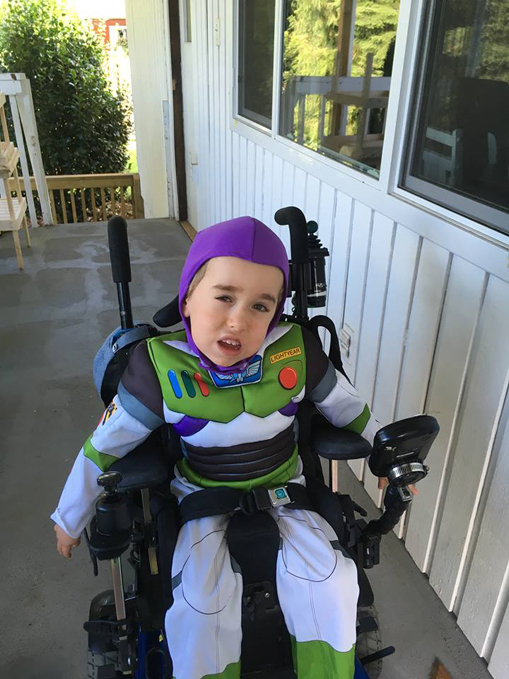 On August 18, 2015 Emmett was diagnosed with Spinal Muscular Atrophy, Type 1. By late September his alert eyes were rapidly looking about but his side to side head movement was virtually non-existent. He was losing the ability to control his muscles very quickly - with both arms failing to respond by the end of September 2015. Literally one day he could reach out and grab the ribbon from his helium balloon and then the next day he could not. It was heart breaking and I swear that even at his young age, Emmett knew that something was wrong with him. In October - I believe it was October 7, 2015 - Emmett got his first injection. At that time the drug was known as SMNrx. The drug was later called Nusinersin and, when it came to market, was called Spinraza. He was in the blind trial so we did not officially know if he was receiving the drub or a placebo until almost two years later - unofficially we started seeing improvements rather rapidly. (Interesting fact: the company that developed the drug was called ISIS. They changed their company name to IONIS. The drug was later purchased by BIOGEN. Here's a blog post when Emmett turned one. The italics are a section copied from that post or you can click the link to read the entire post. 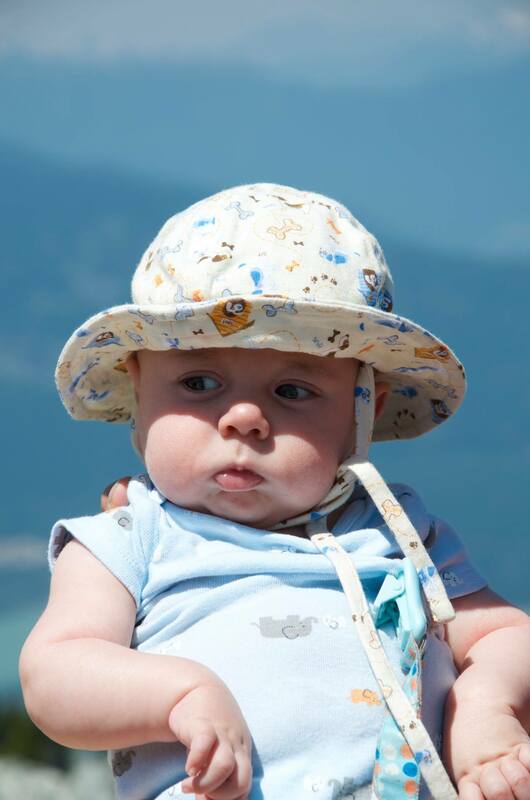 Take a look at Emmett when he was 12 months old. "Spinal Muscular Atrophy, Type One is a challenging and terrifying disease. This SMA can strike at any age IF you have the right (I should probably say wrong) genetics. Both parents have to be carriers, and if they are then there is a 1:4 chance that their children will have SMA and a 2:4 chance that they will be SMA carriers but won't actually have the disease themselves. Scarey odds! If the disease presents itself before the child is six months old, then it is identified as Type 1. Emmett displayed symptoms before his diagnosis at five months but we didn't know what they were. Neither did the professionals during his check ups. It wasn't their fault. The highly trained nurses in the baby clinics and the family practice GP's saw a little boy who was demonstrated delayed development. SMA Type 1 would fall into a category of rare diseases that many medical practitioners may never see in their careers. Parents see their little one 24/7 and must be vigilant and push. And we've said before, when their GP did observe what concerned Alisha and Josh, Emmett was in to a paediatrician in less than 24 hours. The one question that we have heard most often is "What is SMA, Type 1?". SMA being Spinal Muscular Atrophy. Here is another of my attempts to try to describe it. With almost no scientific phrases. Picture your local multi-lane freeway. Traffic flowing perfectly both ways. Everything running like clockwork. No accidents. No flat tires. No construction (yes, that is a miracle in itself). Then see that some challenges intrude. Way ahead someone did get a flat tire or they ran out of gas resulting in a slight slow down of traffic. As you get closer to that incident, someone crashes into the rear end of another in the middle lanes. As you can imagine, traffic is slowed right down and comes to a virtual stop. That's irritating, but you know that in an hour or two you'll be back on your way. Maybe there's a bridge that is the only way across the country and it breaks, falling up, so that this main thoroughfare is out of commission or down to one lane for an unknown timeline. Or picture that there was a massive earthquake that has taken out literally kilometres of this highway. Obviously, the entire country is in chaos as a result of this natural disaster. Your car cannot ever traverse this expanse as the massive highway has literally disappeared. Since the government has no money to fix it (doesn't matter which country, as they're probably all broke), the only way to get from A to B now is to hike on foot or to take a donkey. But it is very hard to find a donkey, so you're left on foot. Of the hundreds of people who try to walk the distance, only a few can get through because it's tough. Climbing cliffs. Jumping crevasses (yes, there's ice everywhere). Crossing expanses of rushing water that has carried a few of the hikers off to the unknown. Very few of the hikers make it to their destination. Most just stop. The economy in this devastated area shuts down - completely. Until the engineers and construction crews can open up a new route nothing moves - and everyone hopes and prays for that a new route is opened. This is similar to SMA, Type 1. The spinal column is the highway and it suffers a major blow. It is no longer healthy and the messages simply cannot get through. As a result the muscles begin to shut down. 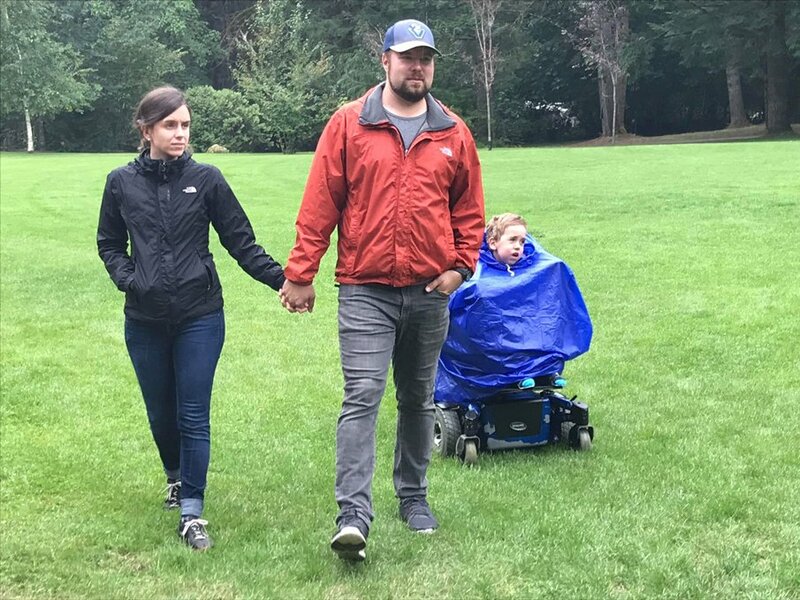 The light at the end of this tunnel (maybe my analogy should have been a train tunnel that runs through a mountain) is the pharmaceutical trial that Emmett was allowed to participate in, beginning last fall. This is the scientists developing a drug that revitalizes the spinal column so that messages from the brain can get through. If this was our highway that had been devastated by the earthquake, the first step would be to open up some kind of walking path. Maybe with ropes across the crevasses and rushing rivers - if you can go hand over hand on the rope you can make it. Tough and very slow, but possible for some. Then the crew sets up a swinging rope bridge which enables many more to cross. With time, sturdier and more expansive paths are created. This experimental drug in this trial is like this. If you are wondering what an EMMETTism is, then I'm guessing that you haven't read this blog too often. Allow me to provide a definition. An EMMETTism is a phrase or comment from Emmett which makes us smile - possibly even laugh. Unfortunately we have forgotten several EMMETTism's, but we have a few here to share with you. N.B., EMMETTism must be typed/written with the first six letters capitalized. There's nothing like freewheeling down a hill. This isn't an EMMETTism - it's just a little boy enjoying life! Emmett loves having a bath. Not just because he loves being clean, because he is fanatical about being clean, but also because it is great physical exercise. One night, while having a bath, Emmett wanted his hair washed with his mommy’s shampoo rather than his baby shampoo. After the bath he was all excited to see himself in the mirror. When he did, he burst into tears. When finally calmed down the reason for the tears came out. Mommy’s shampoo bottle was orange. Emmett thought his hair would be orange. Watching TV, videos, or YouTube is not something that Emmett gets to do very often. It is quite a treat, in fact. In early September Emmett had gotten the sniffles - which he probably caught from me - and was feeling a bit under the weather. One afternoon he looked at his mom and told her that he needed a rest on bipap ‘and a little bit of veggie tales’. Alisha couldn't pass up this request for video time. Emmett loves Toy Story. It is literally his favourite. He gets to watch the DVD while driving to and from BC's Children's Hospital - which will be happening on October 9 (today) as he is heading in for a bunch of assessments and tests - and he does know the story inside and out. He has miniature Toy Story characters that he loves playing with. At almost any time, he can tell you exactly where in the house his Toy Story tupperware container is so that you can find his toys. In the video the toys are only animated when the 'humans' are not around and that includes the boy Andy that the toys belong to, so when the 'humans' are around they stop and drop. One of Emmett's favourite things is shouting "Andy’s coming"! When Emmett does that, you have to stop, fall over and be still. A less challenging command from Emmett is that he will shout "Family Hug!" and Josh, Alisha, and Wendell (the cat) have to stop everything and immediately join with Emmett in a giant bear hug. Of course, there are the longstanding favourites. Carrots. Emmett loves carrots. It will be fantastic when the time comes that Emmett can eat food by mouth versus his tube feedings. We are all, however, quite worried that when he finally tastes carrots that he may be somewhat disappointed! Of course, they will always be orange. His favourite animal is most certainly still the Hippo. And based upon the picture book he knows that Hippos hiccup and giraffe’s laugh. And he still loves orange hippos. We actually found some orange hippos on Amazon and ordered them. They never arrived. After some emails, the seller re-sent the order. And it never arrived. We were quite disappointed but four months later both orders arrived - we now have lots of orange hippos. While camping this summer we were out for a stroll with Emmett. (I like stroll better than walk. Obviously, Emmett doesn't walk. In his power chair he rolls. And stroll has roll in it - so I think it's fitting and inclusive to say we were out for a stroll). As we went around Emmett observed everything from the bugs to the RVs to the other people out for a stroll. He meanders. He does circles. He is a typical three year old. But as we came up to a small parking lot his irregular path suddenly straightened and he went like an arrow straight towards a beautifully restored classic Dodge muscle car. He stopped right at it and rotated his chair to look at us. Then he exclaimed, "This is me!" The car - a brilliant orange. As a three and a half year old Emmett obviously has an early bedtime. Couple that age with SMA and that early bedtime is an absolute necessity as he is exhausted at the end of the day. This led to the next EMMETTism which occurred while camping during the fall. All spring and summer Emmett has been going to bed while the sun has still been up high and bright. Sitting beside the campfire as darkness settled in, Emmett was enjoying the sights and sounds of the campfire. He loved watching others roast marshmallows and enjoyed squishing his own right out of the bag marshmallow. Out of the blue - or rather out of the dark - he exclaimed, "Look! Dots!" as he starred up at the night sky! It has been months since he saw stars and his words failed him. So dots it was! After reading the book the Blue Hippo, in which a real hippo turns into a toy hippo on wheels so he can be close to the little human girl that he loves and then after being forgotten when the girl grows up, becomes the girl's little baby boy, Emmett has decided that he wants an orange hippo on wheels for Christmas, that his mommy wants a blue hippo on wheels, and his daddy wants a green hippo on wheels. Christmas is important for Emmett year round. It was a disaster for Emmett when he lost his playmobile Santa figurine. Fortunately, his grandma Rhonda found one in a thrift store. Hurray! After his fishing excursion with his daddy, Emmett has also added an orange fishing rod to his Christmas wish list! Emmett's Favourite Jokes: These are pretty corny and remember they come from a three year old. Why does Santa have three gardens - So he can hoe, hoe, hoe! Why does the cow cross the road? To get to the moooooo-vies. Why did the banana have to go to the doctor? He wasn't 'peeling' well! 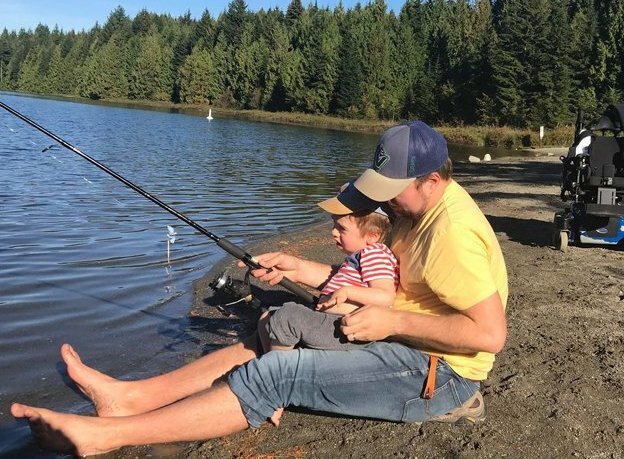 Finally, Emmett will always try to prolong play time, story time, or anytime that he is having fun with the phrase "Just a couple more minutes". Not two minutes. Or five. And if you say two more minutes that is absolutely wrong. It has to be a couple more MINUTES! And yes, he will start to shout minutes if you don't agree with him right away. The blog is finished, but if you have a couple of more minutes, Emmett has finished all of his check-ups at the Children's Hospital today. His neurologist told him and his parents that Emmett, who has SMA Type 1, now presents as having SMA Type 2. We have felt that for a while, but now it's official. This is a pretty big Spinraza moment for us. This drug is literally a miraculous and life changing five millilitres that Emmett gets every four months. WOW! Loved reading about EMMETTisms! 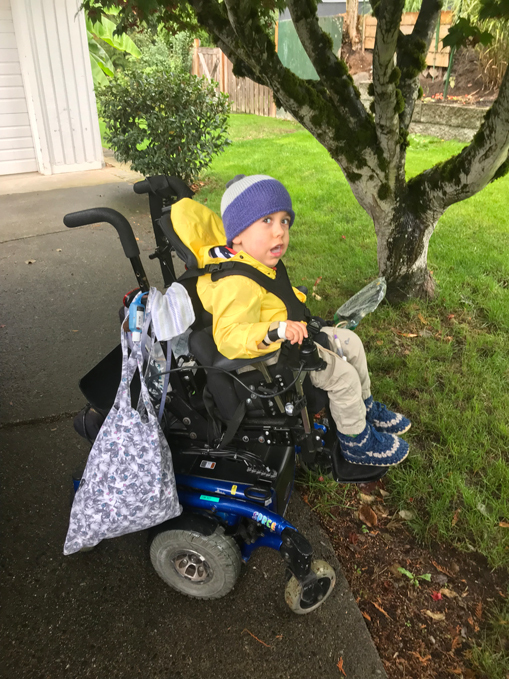 Rejoicing with all of you for the change of Emmett's status - now SMA Type 2!